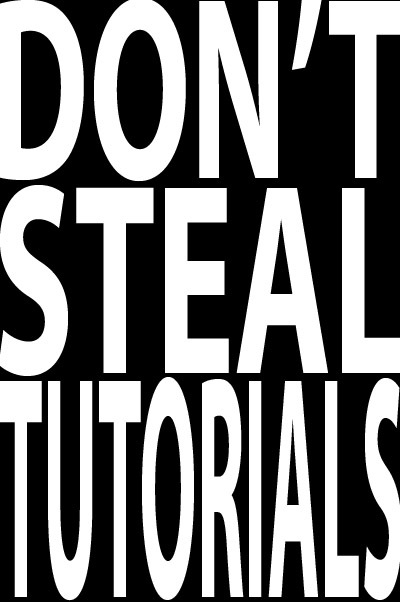 Ok, before you start spamming the post and stating the virtues of tutorials for designers, hear me out! I do tutorials, I love tutorials, however, it is quite ok to use them as tools for learning and improving your skills. We all need a little teaching sometimes. Where my problem lies however is when individuals do these design tutorials, and put up the finished tutorial and then claim it as an original piece. Come on! At least give credit where credit is due. Even professionals when they use a style or or a plug-in they plug the original owner of that plug-in or the creator of the style. I say stolen because that is exactly what you do when you do that, you’re stealing, leeching off another man’s creativity and claiming it for yourself. They then give you the job, expecting work of the same quality but guess what? There is no tutorial for that job you’re doing so…you let them down by giving them work that’s not of the standards of the tutorials you were pushing as your work. Know what happens then? Good, I don’t have to go into it then. Stealing is still a crime. If you were an author, would you want to open the pages of a New York Times’ best seller only to see words written by you and you weren’t credited nor do you remember giving any permission to reproduce your works. Would you be happy? I thought so. Basically I’m saying, use these tutorials for the purpose they were created. To teach you various aspects of whatever your area of specialty. Do them, learn from them and use the concepts learnt to improve the quality of your work.